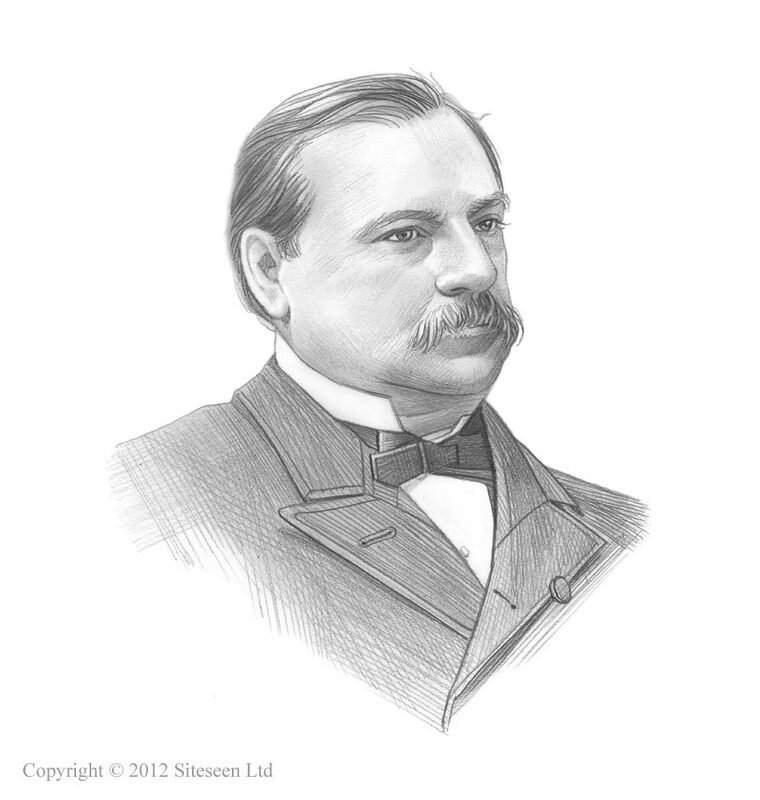 Klondike Gold Rush: Grover Cleveland was the 22nd and 24th American President who served in office from March 4, 1885 to March 4, 1889 and from March 4, 1893 - March 4,1897. One of the important events during his presidency was the Klondike Gold Rush, Yukon, Alaska. Summary and definition: The Klondike Gold Rush began with the discovery by George Carmack on August 16, 1896 in Rabbit Creek part of the Klondike River, a tributary of the Yukon River which flowed through Alaska and the Yukon Territory in in north-western Canada. The Klondike Gold Rush led to a stampede of hopeful prospectors to Alaska and brought substantial economic benefits to the United States of America. There are several FAQ's (frequently asked questions) asked about the Klondike Gold Rush. When did the Klondike Gold Rush begin? The date the Klondike Gold Rush began was on August 16, 1896 on the Yukon River in Alaska - look at the Klondike Gold Rush Map. The discovery was made in Rabbit (Bonanza) Creek. When did the Klondike Gold Rush end? The Klondike Gold Rush was officially over by the Summer of 1899 (production ended in 1907). Gold was then discovered on the beaches in Nome, Alaska and the next rush began. When did the United States purchase Alaska? The Alaska Purchase was made by the United States of America from Russia in 1867 for a price of $7.2 million dollars. To reach the gold fields of the Klondike Gold Rush most took the Skagway/Dyea route through the ports of Dyea and Skagway by Chikoot Pass. The Klondikers followed either the Chilkoot or the White Pass trails to the Yukon River and sail down to the Klondike. Others took the water route all the way up to the area, starting from Seattle. Why was the Klondike Gold Rush important? The Klondike Gold Rush was important because the Purchase of Alaska for $7.2 million was originally viewed as a massive mistake and an economic liability for the nation - this opinion was totally reversed with the discovery of this precious resource by George Carmack. The discovery was made during a depression and immediately made a significant, highly beneficial impact on the economy of the nation. It was also important because it brought about a rapid advance in the development and infrastructure of the Alaska and the Yukon Territory. History timeline and interesting info about the Klondike Gold Rush. George Carmack made his discovery by accident when he was fishing for salmon with his wife Kate Carmack, her brother Skookum Jim Mason and a friend called Dawson Charlie. George Carmack later said that he spotted a thumb-sized nugget of gold jutting out from the creek bank and Skookum Jim claimed that he had a vision of his spirit helper that he would find wealth in the north . August 17, 1896: George Carmack stakes the first claim on Bonanza Creek at the police post at the mouth of the Forty mile River and also stakes claims for Skookum Jim and Dawson Charlie. Making a claim in the Klondike Gold Rush: A prospector would drive stakes into the ground at a measured distance apart to 'stake a claim'. They would then register the claim. A Klondike Gold Rush prospector could only stake one claim along a 500 foot (150 m) long stretch of a creek - which left the region for more miners to stake a claim which explains why a rush or stampede would occur. Claims could also be purchased. George Carmack's discovery sparked the last great western gold rush and the stampede to Alaska began. 1896: Dawson City was founded at the meeting of the Klondike and the Yukon River, and had a population of 5,000 by the end of the year and by the summer of 1898 the population would grow to 30,000 people. It was officially named in January 1897. December 1896: By this time 500 claims were located and all of Bonanza Creek had been claimed. July, 1897: A group of prospectors arrived at Seattle from the Klondike, bringing with them nuggets and dust weighing more than one ton and worth $1.5 million dollars. July 19, 1897: The Seattle Post was the first newspaper to report the Klondike Gold Rush - the news soon spreads nationwide. July 20, 1897: The very next day the stampede began as the steamship Al-Ki departed with a full deck of stampeders and 350 tons of supplies, including food, pack animals, equipment and clothing for prospectors. June 13, 1898: Yukon is made a Territory. July 1899: The first White Pass and Yukon Route train runs from Skagway, Alaska to Carcross, Yukon. Boom Towns: Boom Towns emerged such as Dawson City and Valdez and money was made by the entrepreneurs who opened stores, dance halls and saloons. As many as 50,000 prospectors flocked to Alaska during Klondike Gold Rush. The winter Arctic climate caused great hardship and suffering to the prospectors and many of the miners returned to their homes poorer than when they left them. Only a few hundred became wealthy men. What happened to George Carmack after the Klondike Gold Rush? He became and extremely wealthy man and retired to Vancouver. He died in 1922 at the age of 61, a respected benefactor of the city.